Children enjoy playing with inflatable items, including the bouncy castle. Inflatable jumping castles are a major source of entertainment for children of all ages. They can have fun at home, parties, festivals, food chains, parks, schools and shopping malls. As the main attraction at different parties, even adults can jump around the castles. Inflatable bouncy castles are certainly entertaining but they are also linked to numerous benefits. Jumping around in a bouncy castle is good and fun exercise for children. Regular physical activity is recommended for all children. Parents who may be concerned about their children’s physical fitness and healthy weight management should consider renting a bouncy castle. Spending some time in a jumping castle is a great workout. A bouncy castle is much more enjoyable when two or more children play together. Bouncy castles often attract other kids and create the best excuse to hang out with friends. Kids take turns, play with each other and become conscious enough to avoid bumping into each other as they play. Playing in groups in a bouncy castle makes it easier for children to interact and make new friends while enhancing their social skills. It gives them the chance to learn how to share, play with others and be considerate. 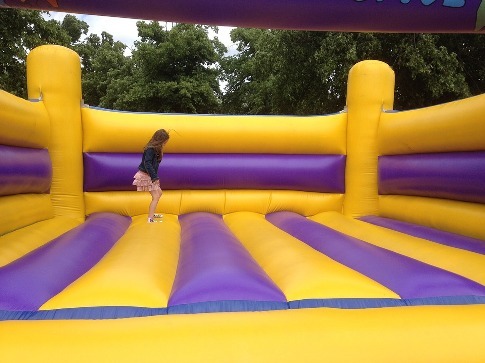 Inflatable bouncy castles provide a safe environment for children. Kids can have fun and enjoy games within the safe playing area of a jumping castle. As long as the limit of children using the bouncy castle is adhered to, safety concerns are minimal. Click here for a bouncy house for rent. Bouncy castles help to improve imagination. Kids often feel like they are airborne with the ability to fly. They can delve into the magical world of the jumping castle and create a variety of new games. Inflatable jumping castles enhance strategic thinking and planning among kids. They also help children improve their sense of balance. Kids attempt to maintain their balance as they jump, roll and run across the surface of the jumping castle. Playing in a bouncy castle has a positive impact on overall physical skills. It is normal for children to enjoy jumping around. Bouncing is a great way to regulate your senses. It can effectively calm you down or wake up your system. There are times when it may seem virtually impossible to get the children outside for a day of fun and sunshine. With a jumping castle, kids do not need a lot of convincing to get them to utilize their energy. Parents and children can all benefit from a dose of exercise and fresh air. Reactions, reflexes and speed are valuable skills that children can develop on a bouncy castle. Kids quickly realize that you need to move with relative speed and have to react to the dynamic environment in the castle that is constantly changing. Being able to adapt to their surroundings enables them to avoid obstructing the path of other children or falling. Rental services are a cost effective way to access a range of castles that can be used in indoor and outdoor locations.